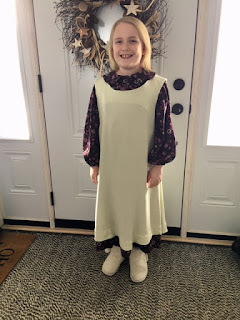 It's been a long time since I did a blog post and a long time since I actually did some sewing. My stash sorely needs busting so perhaps this can be a new trend. Miss C's class was going on a trip to a heritage school and asked me to make her a dress from the late 1800's. I showed her all the fabric I had that was 3 meters in length ... never mind they weren't fabrics typical of pioneer time. She made her selection and together we pinned all the pattern pieces. We used McCall's pattern 7231, size 12. It went together quickly. She had a fun day at the school and the teacher was a high school friend of her mother. I remember her well and I'm sure she's a wonderful teacher. Note to self: size 12 ran large and long.